All you need are some paper cut-outs, maybe some googly eyes, and a cat. Don’t forget the cat! That’s very important. For a while now, Twitter users in Japan have noted that the backs of cats look like Totoro from the iconic Studio Ghibli movie My Neighbor Totoro. If you can’t see it, maybe some cut outs will help. Recently, Twitter user Tuna Melt just added some googly-eyes, tweeting out the following photos—which have seen been retweeted over 12,000 times. 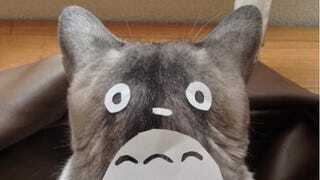 As Japanese site Curazy points out, this looks like the smaller sized Totoros, which are usually white. If you have a white cat, then try it when that! If you don’t, that’s okay. I won’t judge.